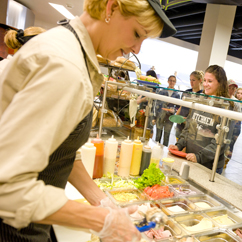 Eating in a college cafeteria can be intimidating, especially if you wish to eat organic or if you are a vegetarian, a vegan, gluten-free, lactose intolerant, or have any other food allergy. In reality, the majority of the food is geared towards the typical meat-eating, starch-loving young adults of today’s American culture. However, you’re not going to starve. You can and will find things that are both healthy and delicious without eating something you’re morally against or allergic to. It will just take a little planning. As I enter the cafeteria, what do I see? French fries, hamburgers, mystery meat, caviar. (Yeah, my school is crazy.) The salad bar is full of wilted lettuce and floppy cucumber slices. The sandwich line is full of full-fat mayo and lunch meat. What will I eat?! 1. The Sandwich Line is Your Friend. Nothing else to eat? Make yourself a sandwich! Whole grain bread will provide you with complex carbs and fiber to keep you full longer. If you’re looking for some protein in your meal add some chicken or turkey to your sandwich. Don’t forget to include your vegetables! Dark leafy greens and tomatoes are my personal favorites. Some other great veggies for on sandwiches include peppers, mushrooms or avocado (if your cafeteria has them). Don’t forget to add some fresh or steamed vegetables and fresh fruit to your meal! A great way to get a delicious meal out of your cafeteria is to get a little crafty, and combine dishes to create your own unique meal. Take whole wheat pasta from one part of the cafeteria, add steamed vegetables to the mix then put your favorite, healthy sauce on top. My favorite combos include roasted zucchini and tomato sauce or steamed broccoli and olive oil. (You may be able to find olive oil by the salad bar!) Add chicken, ham, or turkey if you’re interested in incorporating some protein into your meal. Fried chicken not your style? Ask the cafeteria employees if they’ll make you a grilled version instead. They can usually meet these requests; you just have to be willing to ask! Tired of the typical lettuce/cucumber/carrot/dressing combination? I am too! Look for dark leafy greens instead of the iceberg lettuce to get the most nutrition out of your salad. Add your favorite toppings from the salad bar, but don’t be afraid to mix in some ingredients from other parts of the cafeteria! Add some grilled chicken for protein or look for mushrooms or peppers from other sections of the cafeteria. Look for fruits like fresh grapes or cubed pineapple to add a sweet side to your salad. And avoid the creamy dressings! The vinaigrettes are just as delicious but healthier. 5. Don’t Be Afraid to Ask! Don’t see something you want? Speak up! Fill out a comment card; get other students to fill them out as well. Send an email to the food service department. Make sure your email is well worded and you effectively ask for what you want and explain why it will be beneficial to have it in the cafeteria. Do your research, don’t just sit there paying for food you don’t enjoy. The worst they can do is turn you down. The best situation is you end up with a cafeteria full of food you can actually enjoy that is good for you as well!